After the first Faculty Senate meeting in September, concerns were raised on the amount of animals in classrooms. Rumors were brought up, such as dogs and puppies being in the classroom, causing a distraction in the classroom and barking at professors. Professors were alarmed by the rumors and are concerned with what could be done to handle a similar situation. Under the federal law there are two types of animals that are protected. These animals include emotional support animals and service animals. Emotional support animals are also known as ESAs or comfort animals and there is no restriction on the type of animal that is being used. These animals do not require training and are restricted to an individual’s residence. Documentation is reviewed by the director of academic support, but agreement on the animal’s access on campus is within review of Residential Living and Learning (RL&L). If a violation were to occur such as having an ESA in any building other than the designated residence hall it should be reported to RL&L. On the other hand, “service animals are trained to do specific tasks for a person with a disability,” Geye said. “Service animals are protected by the ADA and should essentially be viewed as auxiliary equipment, much like a wheelchair,” Geye said. Bobo said she wished people would understand proper etiquette when being around service animals. Bobo said she usually does not let people touch her dog without her permission because the dogs are working and need to be focused on their owner because they are at work. “I say treat a service dog like you would a wheel chair; you don’t talk to a wheel chair, you don’t ask to pet a wheelchair. You would respect it. Let them have their little bubble and just leave them alone. Don’t stare or get down at their level,” Bobo said. Service animals have their access governed by the (ADA). Service animals operate in accordance with their handler’s rights and have very few places where they are not allowed. “Service animals should be with the person they are serving and leashed at all times unless there is a disability reason,” Bobo said. Wearing a harness or a vest are not required by the ADA, but some handlers do choose to have their service animal wear one to indicate that they are working. “Typically service dogs are marked. My dog has a vest that says ‘working dog, service dog,’” Marks said. “It is not legally required for a service animal to wear vest, but most service dogs do because people don’t want people to come up and pet their dogs. They want to be left alone so the dog can do their job,” Bobo said. “The university is not required to have any documentation or registry of the student’s disability status or dog training,” Marks said. “Certifications and registrations and anything of that sort are all fake,” Bobo said. Bobo said there are websites that will charge for registering your animal, but they hold no legal power. Most people who do register their animals are often the ones who are not real service animals. Is this animal providing service to you as a person with a disability? If the person answers yes, continue on to the next question. If not, then deny them access. And second people can ask, what trained tasks does it perform? If a task is not described, deny access. “I would rather everywhere I go have someone ask me those two questions politely than deal with fake service dogs,” Bobo said. “Those two questions don’t scare me because I know the answers. I do have a disability and I do have a dog who does tasks for those disabilities. And I feel like someone who wouldn’t really have a service animal would get offended and be like ‘oh you are calling me disabled,’” Marks said. “People are not technically allowed to ask the gender or breed of the animal but most owners are understanding because they know people ask out of curiosity,” said Bobo. Geye said if an animal is presented as a service animal and is disrupting the classroom or engages in unexpected behavior, it should be handled just as they would any other misbehavior in class. “I want professors to understand they are allowed to kick a dog out if it is not in control of the owner, even if they do perform a service task,” Bobo said. Bobo and Marks said they both feel something legally should be done in order to help protect actual service dogs and themselves. “I feel like the university has the responsibility to protect their disabled students,” Bobo said. “Essentially, the misinterpretation of an animal as a service animal is considered to be a misdemeanor and can lead to disciplinary actions by the university,” Bobo said. Bobo and Marks said they’ve both seen fake service animals on campus snap at people and attack other animals on campus. If you have been injured in an animal attack then you may want to contact someone like these GJEL Accident Attorneys for legal help. Marks said if she ever sees a dog walk by on campus, she would much rather wait until the other dog completely passes and be late to where she needs to be, than risk having another dog get aggressive toward her own dog. 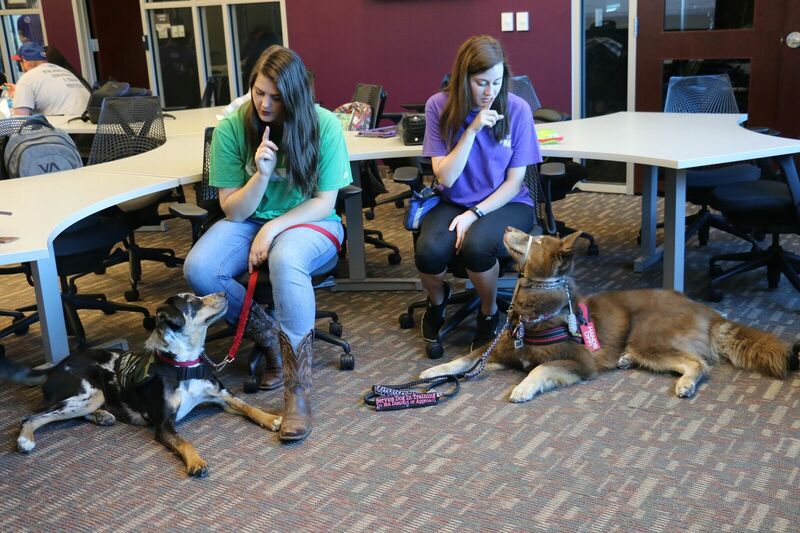 “Maybe sending out an email to the university about the issue the campus is facing with fake service animals in class and how they will be enforcing the citation if the animal does not meet the ADA requirements,” Bobo said. Bobo and Marks said they hope the university will educate the staff and the professors on how to approach this issue and inform students that they will be enforcing the rules.